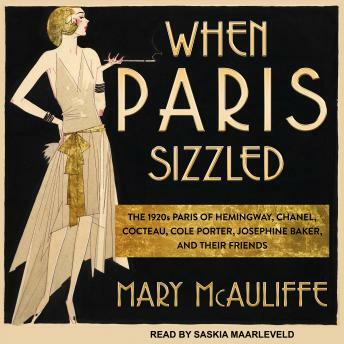 When Paris Sizzled vividly portrays the City of Light during the fabulous 1920s, les Annees folles, when Parisians emerged from the horrors of war to find that a new world greeted them-one that reverberated with the hard metallic clang of the assembly line, the roar of automobiles, and the beat of jazz. Mary McAuliffe traces a decade that saw seismic change on almost every front, from art and architecture to music, literature, fashion, entertainment, transportation, and, most notably, behavior. The epicenter of all this creativity, as well as of the era's good times, was Montparnasse, where impoverished artists and writers found colleagues and cafes, and tourists discovered the Paris of their dreams. Major figures on the Paris scene-such as Gertrude Stein, Jean Cocteau, Picasso, Stravinsky, Diaghilev, and Proust-continued to hold sway, while others now came to prominence-including Ernest Hemingway, Coco Chanel, Cole Porter, and Josephine Baker, as well as Andre Citroën, Le Corbusier, Man Ray, Sylvia Beach, James Joyce, and the irrepressible Kiki of Montparnasse.